It’s flu season again, and the push to get everyone in America vaccinated for the flu vaccine is in full swing. Please be aware that those who want you to receive the flu vaccine admittedly do not want you to know about the risks associated with the vaccine. They actively try to suppress information that would educate people on the dangers and risks of the flu vaccine and decrease their sales. Secondly, please look at the settled cases for vaccine injuries and deaths due to the flu vaccine the U.S. government pays out to victims: Flu Vaccine is the most Dangerous Vaccine in the U. S. based on Settled Cases for Injuries. This information is not published in the mainstream media. This year, there is a heavy push on to give kids the nasal flu vaccine, and it is being rolled out for the first time in the UK. Celeste McGovern, writing for GreenMedInfo.com, gives 6 reasons why she will not be giving this vaccine to her children. Two of my daughters arrived home from primary school last week with public health packages in their bags. It’s that time of year again, when nurses are out in force like army recruitment officers, waging a war on deadly germs and rounding up volunteers for vaccines. This year in the United Kingdom the intranasal flu vaccine is being rolled out. It’s already been used in the United States where 14 to 15 million doses of AstraZeneca’s FluMist are currently in distribution for this flu season but this is the first year it is being offered under the brand name Fluenza Tetra in the UK to all children older than 24 months and it is heavily promoted by public health officials. 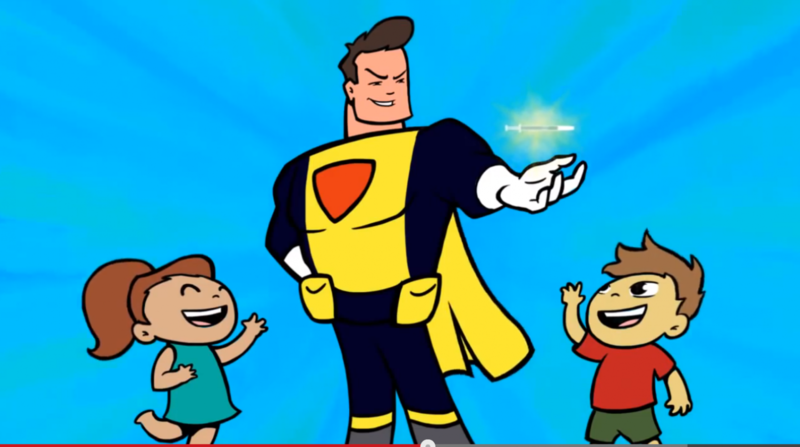 They’ve even produced a “Flu Hero” cartoon directed at children in which a superhero gives a little boy a nasal flu vaccine which, like a bite from a radioactive spider, transforms him into a superhero himself with super defenses. I hate the flu as much as other parents, but the public health information struck me as superficial and smacked of a sales pitch, so I decided to look a little deeper into the vaccine and here are the top half dozen reasons my children won’t be going near it. 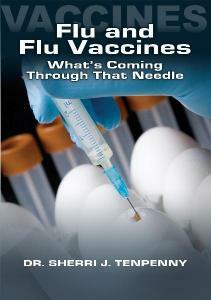 A lot of effort has been put into dispelling the “myth” that you can get the flu from the flu vaccine. Little wonder such a myth exists though, when the listed side effects for the vaccine are exactly those listed for flu: runny or stuffed nose, headaches and muscle aches, sore throat, loss of appetite, chills and fever. It’s not influenza, we’re told, it just feels like it. But the flu vaccine does contain live flu viruses. According to an electronic Medicines Compendium printout , each vial of Fluenza Tetra vaccine mist contains 107 — that’s 10 million — of each of four strains of reassorted live attenuated and “genetically modified organisms”—for each nostril. That’s 80 million viruses (give or take) per dose, designed to replicate inside a child’s nasal passages. These engineered viruses include H1N1 (swine flu), and three other strains that are based on what scientists admit to being best guesses for the most likely influenza viruses in circulation this year. 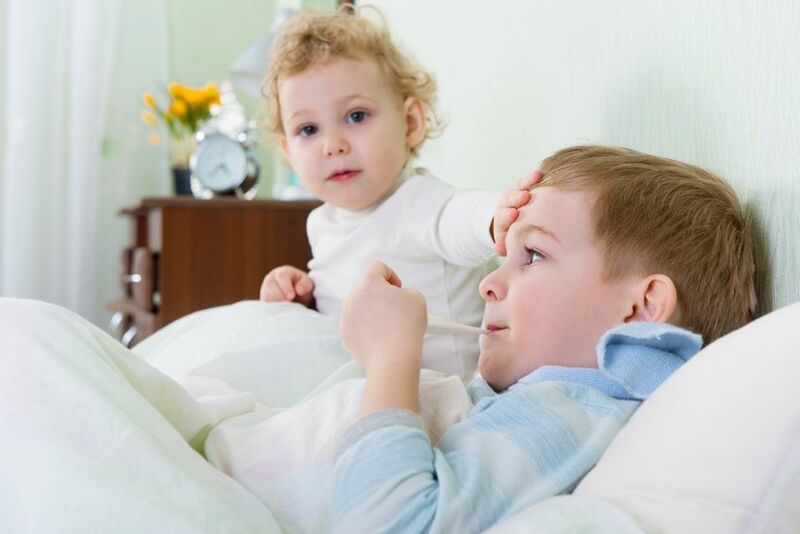 Live viruses up our nasal passages are dangerous because they can lead to encephalitis or swelling of the brain which, while rare, can also kill and disable people, just like the rare worst case flu. They can also cross the blood brain barrier and lead to long term brain inflammation. True, we are exposed to airborne viruses and bacteria all the time and our immune systems generally conquer them, but this man-made solution is far more concentrated than anything we would expect to find naturally. To put it in perspective, in one 2011 study, Virginia Tech scientists sampled the air in doctors’ offices, nurseries and airplanes and found an average 16,000 viruses suspended in each cubic meter of air — enough virus, they concluded, to infect a person within an hour. But with the flu mist vaccine we’d be instantly bathing a child’s nasal passages in thousands times this concentration. Couldn’t it overwhelm some children’s immune systems? And can’t the children spread these viruses? It turns out that most people do shed live flu vaccine viruses up to 11 days post nasal vaccination. And the younger they are, the more they spread it. At least one documented case of transmission was observed in a clinical trial in which an unvaccinated daycare worker was infected with a virus from a vaccinated child. We know viruses mutate, just like bacteria that develop antibiotic resistance, so why are public health officials so confident these viruses will never revert to the wild-type infectious virus or perhaps to something more virulent? Take away point: To avoid illness, avoid weird viruses. Besides genetically engineered live viruses, what else is in the nasal flu vaccine? The first excipient ingredient listed is monosodium glutamate. Seriously. MSG. Neurosurgeon Russell Blaylock’s terrifying book Excitotoxins: The Taste That Kills explains how scientists have known for decades that MSG literally excites brain cells to death (hence the name excitotoxins) and can cause the sort of sustained brain inflammation common to neurological diseases from autism and Alzheimer’s to Multiple Sclerosis and Parkinson’s. It documents how it is particularly damaging to developing brains too, which is why MSG was banned from baby food. After reading the book, I dumped all the MSG-laced soups, sauces and snacks from my kitchen cupboards and barred them. Now, the public health service wants my kids to freebase MSG like cocaine? I contacted Dr. Blaylock, the man who has done more to warn people of the brain dangers of MSG and aspartame than anyone alive, to see what he thinks. Extensive research has shown that various metals, viruses, chemicals like MSG and pharmaceuticals enter the brain via the olfactory tract and from there they travel directly to the most vulnerable parts of the brain–parts affecting memory and behaviour, he explained. In their 2010 study, Airborne inflammatory factors: “from the nose to the brain,” University of Maryland neuroimmunologists review the vast literature on the impact of viruses, metals, toxins and other foreign invaders on the human brain and behaviour and conclude that “[a]irborne infectious, allergic and pollution agents are among the most common inflammatory factors which may affect brain function via the brain-nose interface.” These inflammatory processes , though poorly understood, they added, are demonstrated to alter behaviour and are very likely triggers in development of neurological disease and mental illness. The impact would be upon brain development as well as acute function. Since the area of the brain involved is so critical to learning, behavior and language, to endanger these parts of the brain would constitute malpractice. It could manifest as a number of neurological and behavioral problems, such as anger, irritability, poor concentration and focus, difficulty learning, poor attention, language difficulties and loss of behavioral control, especially for fear and anger. All of these things severely limit the ability of the child to cope with life events and to develop normally. I think that means pass on it. I would rather my children had a flu than risked brain damage. Narcolepsy is a chronic sleep disorder which causes excessive daytime sleepiness and sudden physical collapses. Sufferers can fall asleep several times a day because of loss of tens of thousands of neurons that control the sleep/wake cycle. The exact mechanisms of narcolepsy’s development is unconfirmed but the epidemiology linking it to vaccination is rock solid. I was at the 9th International Congress on Autoimmunity in France in March this year where Outi Vaarala, Head of the Immune Response Unit at Finland’s National Institute for Health, presented her findings on the 2009 swine flu (H1N1) vaccine and an epidemic of narcolepsy which she said astonished her. The incidence of narcolepsy among vaccinated individuals was 9.0 per 100,000 compared to 0.7 in unvaccinated individuals. Since then, dozens of other cases of vaccine-induced narcolepsy have been identified in the United Kingdom, Canada and elsewhere. At the same congress, many top level immunologists were discussing ASIA syndrome — or Autoimmunity Syndrome Induced by Adjuvants, (including metals and chemicals such as aluminium and squalene,) added to vaccines and their role in triggering the current epidemic of autoimmune diseases ranging from diabetes to rheumatoid arthritis. Why isn’t this science mentioned in the government handouts on the H1N1 vaccine? If one vaccine can launch a disease as serious as narcolepsy , what else can it do? And taken together, year upon year, do risks from vaccines accumulate? I’d rather risk letting my children get influenza than expose them to a risk of developing serious and intractable autoimmune diseases. Children who have severe egg allergies are warned to avoid FluMist and Fluenz vaccines because the viruses contained in them are grown on chicken eggs (probably not the free range/organic type) But how did these children develop egg allergies to begin with? Pharmaceutical companies have never studied whether vaccines, which are designed to directly and powerfully stimulate the immune system, are related to subsequent development of food allergies. Perhaps they just never thought of it. Apparently other scientists have however. This study describes how scientists induce a peanut allergy in mice (which don’t get food allergies unless you create one) by administering a peanut extract at the same time as a powerful immune stimulant (in this case extracts of bacteria). Vaccines are powerful immune stimulators and they contain extracts of bacteria and viruses too. Could it be that exposure to certain proteins at the same time as priming the immune system raises the risk of instigating food allergies? Is it possible that if my children don’t have an egg allergy yet, an egg-containing vaccine like the nasal flu might just give them one? I’d rather not find out. Another surprising ingredient in the nasal flu vaccine is gentamicin. An antibiotic. Didn’t the US Centers for Disease Control just issue warnings about the end of the antibiotic era and the emergence of superbugs due to antibiotic overuse? Isn’t that why doctors’ offices are suddenly plastered with posters sternly advising us not to ask for antibiotics which don’t work for viruses. Why then would public health officials be administering antibiotics to millions of healthy children? A huge number of current studies are cataloging and investigating the role of all the microbes in our body. After decades of cavalierly tossing antibiotics around like tongue depressors, it turns out our microecology is a lot more complicated than the old medical textbooks acknowledged and weneed our microbes. In fact, they comprise 10 times as much genetic material in our bodies’ than our own cells, and they play crucial roles digesting our food, manufacturing our vitamins, regulating gene expression, signaling our immune systems and so on. It’s sort of like the discovery of a New World in medicine, an entirely new paradigm for understanding and treating disease. Pharmaceutical companies have never looked at how vaccines impact “non-target” viruses and bacteria – the microecology of our bodies –just as they’ve never looked at the impact of vaccines on cancer or fertility, for example. It’s not required for licensing, so why bother, I guess. Other scientists have begun to investigate this realm recently, however. A study published in mBio, a publication of the American Society for Microbiology, this year claims to be the first ever to look at the impact of a live attenuated flu vaccine virus on other microbes in mice: “we find that LAIV vaccination reverses normal bacterial clearance from the nasopharynx and significantly increases bacterial carriage densities of the clinically important bacterial pathogens Streptococcus pneumoniae and Staphylococcus aureus,” the scientists reported. “ While care should be taken to not overgeneralize the data described here to all vaccines, the broad implications suggest that live attenuated viral vaccines may have unintended consequences on important human bacterial pathogens unrelated to the vaccine target species.” It implies, too, that the vaccine viruses might just also be impacting hundreds of non-investigated microbes. And it raises questions about the spread of “non-target” pathogens from vaccinated individuals. Is it really the vaccinated kids who are dangerous to public health? I checked out the known side effects for gentamicin as well. Scary. Everything from agitation and coma through hallucinations to wheezing. Abdominal pain is first place on the list. One study of the FluMist vaccine found that two per cent of vaccinated children experienced abdominal pain compared to none in the placebo group. Could that be from gentamicin? There is no explanation offered in the public paperwork on the vaccine. A lot of questions about the vaccine go unanswered it seems. A representative from AstraZeneca told me last week that she couldn’t answer my questions about the nasal flu vaccine herself because I was “directly interfacing with the public.” Later she said my questions had been sent to her colleagues for review and answers were forthcoming, but then my e-mails and phone calls went unanswered altogether. Maybe AstraZeneca didn’t have answers for my questions or maybe they didn’t want them interfacing with the public. Who knows. One thing is certain though: their vaccine won’t be interfacing with my kids.